If you’ve ever been in the pursuit of happiness, or want to know more about that elusive and mysterious state of being, here’s the perfect book. 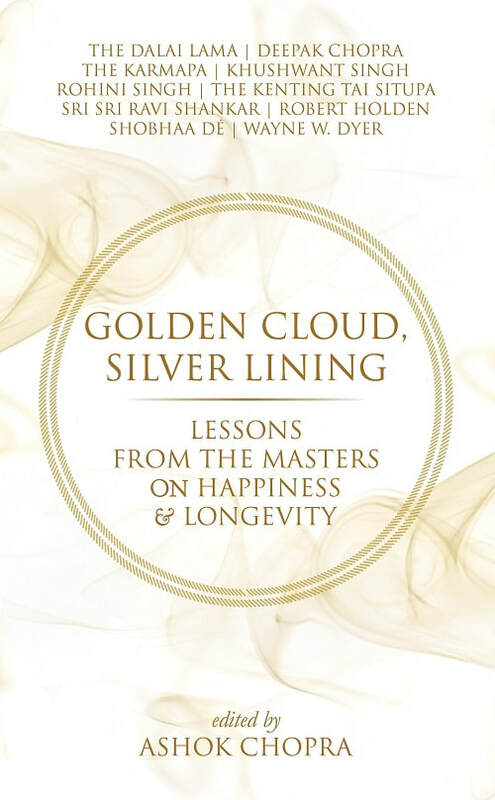 With writing from some of the greatest spiritual thinkers in our country, Golden Cloud, Silver Lining is full of wisdom, insight and gentle guidance to those seeking a life of happiness but who simply don’t know where to look for it. Stalwarts such as The Dalai Lama, Deepak Chopra, Wayne Dyer, The Karmapa, The Kenting Tai Situpa, Sri Sri Ravi Shankar, Robert Holden, Rohini Singh, Khushwant Singh and Shobhaa Dé reveal their personal thoughts and unique views on the secret to true happiness, and in turn, a long and peaceful life. Whether it be dealing with stress and environmental factors or relationships and emotions we can’t seem to control, there is a simple, spiritual truth from a master to help you see the light. Is happiness something we even need to seek? Will it elude us the more we chase its golden glow? Beautifully written and curated, this collection of essays from some exceptional thinkers is great food for thought and a definite pointer in the right direction to a more fulfilled, happy and present way of being.